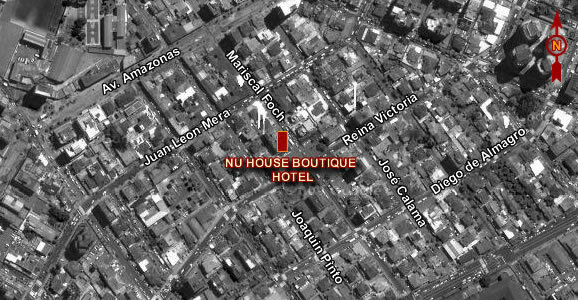 Nü House Hotel is located in the Plaza Foch, the heart of the Zona Rosa in Quito, a few steps from the most famous and luxurious restaurants, bars, discos and lounges. It exudes a perfect blend of services for those who come for rest or visitors to the city on business. The Hotel is focused on providing a different experience to guests and not just an accommodation. With its modern design, personalized service, and incomparable location, Nü House is the perfect destination for an unforgettable stay. Boutique Hotel Nu House has 57 rooms full of comfort and technology, equipped with LCD 32'' screens, TV cable, high speed internet, digital safe, minibar, bathrobes, hairdryers, and coverage for a warm and good night.